Details relating to the Monaco Commemorative of 2018. In the inner circle we see a portrait of Bosio by the painter Julien-Léopold Boilly. To the right of Bosio is a depiction of his sculpture of the flower-crowned nymph Salmakis. On the edge of the inner circle from eleven o’clock to one o’clock is a bold inscription (“MONACO”) showing the issuing country. At the ,on the edge in the inner circle ,running from eight to four o’clock is the inscription “1768 - SCULPTEUR - 2018”.Preceding and following this inscription are ,respectively the mint mark and the mark of the mint master. 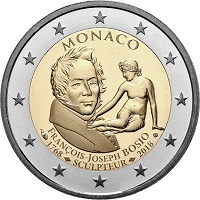 Return from Monaco Commemorative 2018 to euro coin collector.